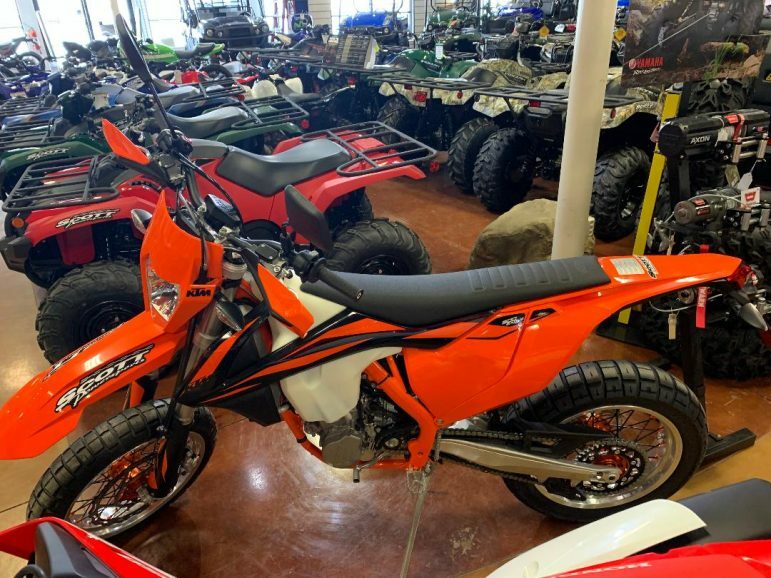 Springfield Township Police are investigating a break-in at a local ATV and motorcyle dealer in which tens of thousands of dollars in inventory was apparently stolen. Police said Kawasaki (green and white), Yamaha (blue and white) and KTM (orange, black and white) motorcycles were all removed from the business and loaded into an unknown type of vehicle or trailer by a thief or thieves. In a post on the business’s Facebook page Friday, someone from Scott Powersports said 11 new 2019 models were stolen in the burglary: CRF110, CRF450, KLX110, KLX100, KX450, KX65, KX85, 300 XC, 450 EXC-F Six Days, 500 EXC-F and YZ125 models. Springfield Township Police said Friday that multiple ATV-type motorcycles were stolen from Scott Powersports overnight last night. “This picture is (of) an actual motorcycle that was taken from the store,” police said. A photo of the break-in scene shared by the Scott Powersports page shows a shattered showroom window with shards of glass littering the showroom floor. Anyone who may have witnessed any vehicles in the Scott Powersports parking lot during the overnight/early morning hours of April 4-5 is asked to contact the Springfield Township Police Department at 610-982-5411. Tips can also be submitted to the police department via Crimewatch. Design Lower Saucon Township’s Next Little Free Library!